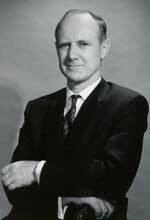 William Pickering was Director of the Jet Propulsion Laboratory (JPL) for the first two decades of the Space Age. Pickering obtained his B.S. and M.S. in electrical engineering, then a Ph.D. in physics from the California Institute of Technology before becoming a professor of electrical engineering there in 1946. In 1944 he organized the electronics efforts at JPL to support guided missile research and development, becoming project manager for the Corporal, the first operational missile to come out of JPL. He served as JPL's director (1954–76), overseeing development of the first American satellite (Explorer 1), the first successful American circumlunar space probe (Pioneer 4), the Mariner flights to Venus and Mars in the early to mid-1960s, the Ranger photographic missions to the Moon in 1964–65, and the Surveyor lunar landings of 1966–67.